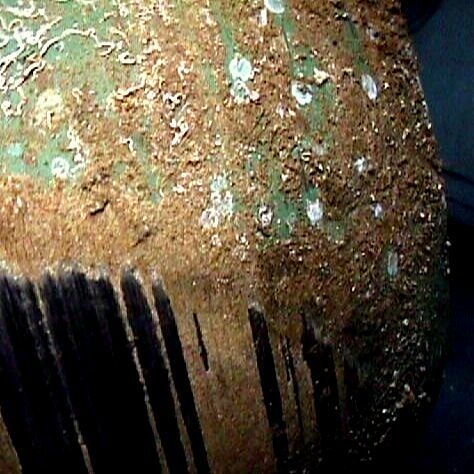 A&A Coatings has developed a process for thermal spraying Ceramics, Carbides, Metals and PTFEs onto Valve Balls to provide a perfect mechanical fit under the most demanding pressures. Our coating is applied to the metal substrate using a 6-Axis Robot. The valve ball is then ground and polished to a super-finish on specifically designed Valve ball grinding equipment to meet tight tolerance requirements on the finished ball. 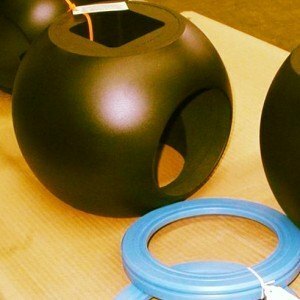 Optional final coating materials are available such as PTFE to impart low friction, non-sticking, anti-fouling properties onto the finished surface of the ball. Valve Ball as received from U.S. Navy after being in service. This ball is ready to be repaired via A&A’s coating process.